Kampung Cina, in Kuala Terengganu, is believed to have been set up by Chinese settlers in the 1700s or even earlier. 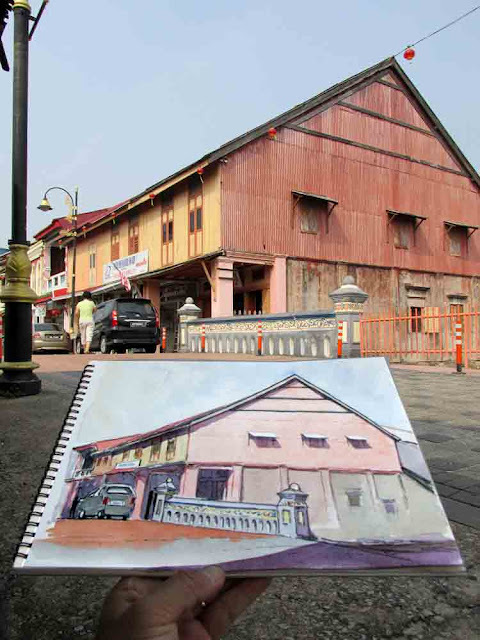 Some of the traditional houses that lined the main street, Jalan Kampung Cina, are believed to be old as the town itself. This part of town is known as Teng Lang Po in the local Hokkien lingo, which means "Chinatown". During my recent trip there, I found that the local community is also quite active in preserving a piece of the tow’s history. As a result, several alleys have been turned into "living museums" to display any artefact found or saved from the wave of development. I chose to sketch this bridge because of its historical significance. From my conversations with the township's elders, this bridge that was built from bricks could be as old as the town itself. About two cars wide, the bridge has parapet walls about 1.5 m high, flanked by square shaped columns. They are adorned with floral motifs. I am not sure if the current colour scheme was the original one, however. The bridge spans across Alor Lorong Jamil, a stream that feeds directly into the Terengganu river before part of the river was reclaimed and turned into the present-day Pulau Warisan, a piece of land that now sits on what used to be the middle of the Terengganu river. According to local history researcher Lorenz Law, 54, the bridge had been mentioned by Munsyi Abdullah in the travel journal recording his voyage from Singapore to Kelantan. In his account of his stopover in Kuala Terengganu in 1838, Munsyi Abdullah wrote that he came across a bridge “one dupa wide and six dupa long (an ancient linear measurement unit equivalent to two yards)” when he visited Kampung China. He also mentioned two rows of brick shophouses on both sides of the main street that were owned by Chinese families who spoke fluent Terengganu-Malay. 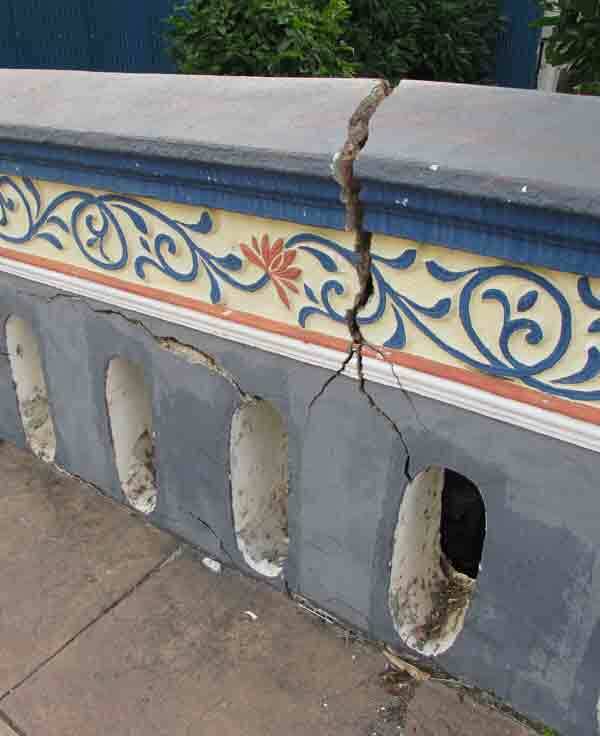 The weight of vehicles being illegally parked on the bridge had caused the left parapet wall to crack recently. However, maintenance staff from the local personnel had repaired it on the afternoon that I painted this scene.